Deep Eddy Vodka Distillery is a distillery located in southwest Austin, Texas that currently manufactures vodka products made of south Texas corn using continuous distillation in a column still. Deep Eddy Vodka is named after the historic landmark Deep Eddy Pool in Austin which is the oldest spring fed swimming pool in Texas. "Made with real cranberries, grown by family-owned farms in New England, our Original Vodka and lightly sweetened with real cane sugar. 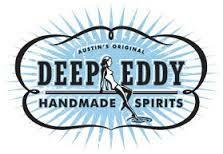 Deep Eddy Cranberry is refreshing and cosmopolitan, perfect for pairing with good times on any occasion." "Made with Deep Eddy's vodka that is distilled 10 times in a state of the art column still in north Austin. Blended with real lemon to give it a tart zip, a slight sweetness, a thick, silky texture. It smells just like a freshly cut lemon." Made with corn and Texas spring water, which gives the vodka its smooth & clean taste. Our straight vodka is 80 proof (40% alcohol by volume) and is gluten free! Distilled 10 Times.